Mattie is a worker at the Fry’s Chocolate Factory when she meets her beloved husband Tom. Starting at Stapleton Road Station, Mattie leads us on an evocative walk through her life and love, through a lost world of haberdashers, cobblers, rationing and chocolate. Please note that the walking route for this story takes you along Greenbank Road (not Greenbank Avenue, as stated). Start on Platform 1, Stapleton Road Train Station. Cross over the bridge to Platform 2 and turn right, going through the station car park. Go down the path onto St Marks Road and bear left down St Marks Road until you get to the Moroccan Restaurant and Mivart Street. Turn right up Mivart Street past Mivart Studios and then turn right at the T junction onto Bellvue Road. Keep going up Bellevue for a short distance to the Greenbank Pub and turn left onto Greenbank Road. Walk up Greenbank Road passing the Spar until you get to the Castle Green Church and then turn right onto Kingsley Road. Go along Kingsley Road and at the next junction turn left onto Co-operation Road. Walk to the end of this road past the Chocolate Factory, turn left onto Turley Road and then down to Greenbank Cemetry where the walk ends. Heads & Tales thanks Bristol City Council for their assistance with the creation of this story, which was recorded by Tony Chamberlain at the studios of Bristol Community FM. 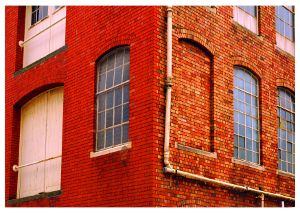 Photograph of the Chocolate Factory by William Datson.